1 November 2015 : Gimme a Potato! That’s my brother, Scott, in this photo. Years ago, he told his eldest daughter that November 1st was National Potato Day. Coming on the day after Halloween, neighbors are warmed up to the idea of people knocking on their doors and expecting something to eat. 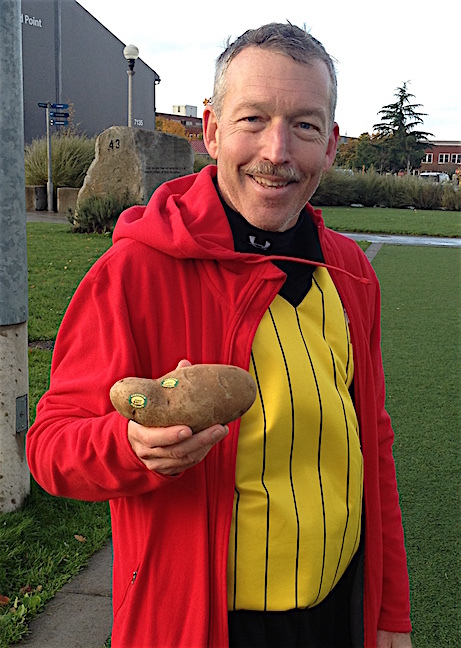 So you knock and when your neighbor answers, you say in a demanding voice, “Gimme a potato!” With Scott refereeing Celeste’s game this afternoon, I made sure to have a potato with me.